Elizabeth was only 55 years old when she passed but she lived an amazing life. She was well-educated, and wrote her very first poem at the age of six or eight. The Battle of Marathon was published when she was fourteen. Elizabeth enjoyed reading Greek and Latin authors, learned to read Hebrew and by twelve, she written a "epic" poem consisting of four books of rhyming couplets. Her adulthood was hard but full of inspiration. 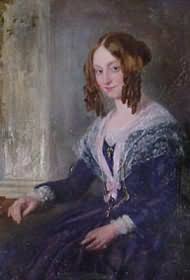 She published many collection of poems, and even supported the abolition of slavery which caused trouble for her family. The family had financial losses and forced them to move three times. Afterwards, Elizabeth became very sick, and even more in risk of her health after the passing of her brother. However, she gain strength and better health because of the most famous courtship in literature; the marriage to Robert Browning. Love conquered all, and she got through everything. Here's a portrait of Elizabeth. Published Works: The Battle of Marathon, An Essay on Mind and Other Poems, Aeschylus's Prometheus Bound, The Runaway Slave at Pilgrim's Point, The Romaunt of Margaret, The Romaunt of the Page, The Poet's Vow, The Cry of the Children, A New Spirit of the Age, A Drama of Exile, A Vision of Poets, Lady Geraldine's Courtship, Poems before Congress, Casa Guidi Windows, Sonnets from the Portuguese, Aurora Leigh, and many others. Elizabeth Barrett Browning has always been one of those writers who act like a polished surface to reflect the concerns of those who write about them. . . . Part of the popular appeal her life has always exerted comes from its evocation of half-recognized motifs from legends, fairy-tales and other fictions; Sleeping Beauty, Juliet and Cinderella all jostle elbows in most accounts of her elopement and marriage, and when Browning reordered them in The Ring and the Book, he found cognates in the stories of Andromeda and Perseus, of St George and the princess victim, even — somewhat embarrassingly — in the flight into Egypt of the Holy Family. Probably a bit too pat for modern readers, particularly when Elizabeth seems to have cast herself in the leading roles. Not the least of their wishfulfilling quality has been that these youthful adventures all happened to a middle-aged woman.